This was dessert for my Burns Night supper, and I originally intended to post it before then so you could enjoy it too – it made a fine, boozy end to a fine boozy meal. Apologies for that, then; but you shouldn’t need such an excuse to eat this. Winter is made for such small indulgences, and this is definitely a winter icecream, perfect for a warm house and a slightly over-full stomach. I prefer my summer ices a little less alcoholic. A good, rich icecream made from scratch is one of the finest of simple luxuries, and – as with most things – is immeasurably improved by two fingers of whisky. Leave out the extras, though, and you have a very lovely basic recipe that is ripe for experimentation. If you make the custard carefully, you shouldn’t even need an icecream maker – the old whisk-and-freeze will do well, although it does take significantly longer. A word of warning – you might think ‘the more booze the better’, but too much and your mixture will not freeze. A double per pint is about the sensible limit, as in life. Gently warm the milk and cream to just below boiling. Meanwhile, beat the yolks with 100g of the sugar until thick and very pale. This is perhaps the most important part of the whole process – use an electric whisk, or you’ll get bored too quickly. When you’re done, the mixture should have doubled or even tripled in volume, and will be the kind of pastel yellow that gets called something like ‘chantrelle’ on colour charts. If in doubt, whisk a bit more. When you’re happy, whisk in the warm dairy. Scrape the mix into a heavy-bottomed saucepan and heat very gently, stirring constantly with a wooden spoon. (A lot of recipes recommend a bain-marie for custard, but it takes forever. Just be careful). As soon as it thickens, take off the heat and strain into a clean bowl. If you can be bothered, place in a sink of cold water or ice and stir until it cools down. You don’t want scrambled eggs, although a certain amount of curdling can be strained out. Leave to cool, and preferably refrigerate overnight. For the praline, toast the oats in a dry pan until they’ve darkened a shade (you could get that colour chart out again here), then add the remaining 30g of sugar and a pinch of salt. Stir and toss until nicely treacle-toffeeish, then pour onto a sheet of greaseproof. When cold, smash up. Ok. Either churn the custard in an icecream-maker, adding the whisky and praline when it’s frozen, OR pour it into a large tub and freeze, uncovered, for an hour. Take out, whisk the edges into the middle, and freeze again; repeat until nearly done, then stir in booze and oats. Either way, a spell in the freezer overnight will finish it off nicely. Some shortbread and the rest of the Macallan would do very well here. Soda bread is great. Not relying on organic, temperamental yeast, it is incredibly quick and easy to make, and forgiving of mishandling. Leavened with bicarbonate of soda, it can also take much more in the way of flavouring than regular breads – yeast can be killed or severely retarded by salt, sugars and fats, which can all be thrown merrily into soda bread. It perhaps doesn’t last as long as a well-nurtured sourdough, but the day-old loaf makes fantastic toast – and anyway, you can just make another one, as it doesn’t take two days to prove. The whole process should take little more than an hour. I’m making this to go with my Burns Night supper – more Irish than Scottish perhaps, but I’m working on a whisky butter to go with it (although I might just add a tot to the dough). 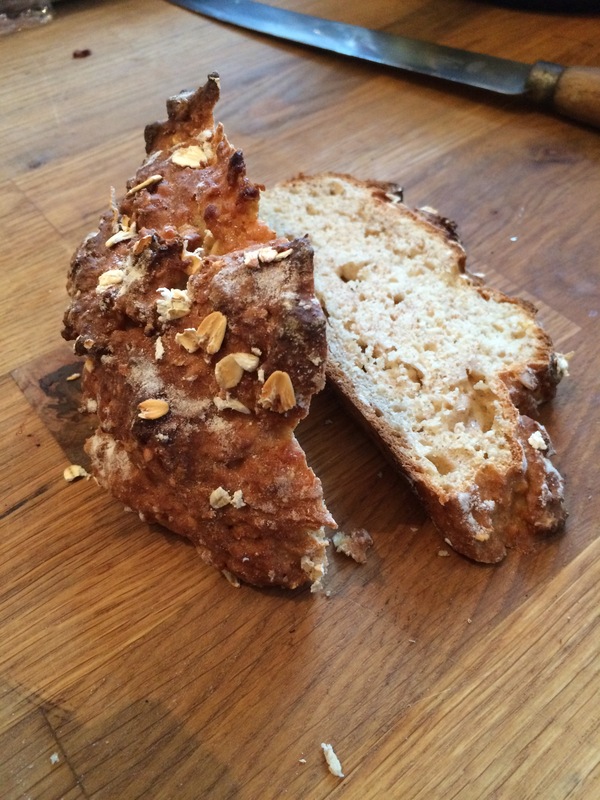 Anyway, the flavours – sweet and salty, rounded, nutty and wholemeal – go well with anything cured or meaty or rich. Ideal for dunking in soups and stews, especially when topped with a snicket of cheese. Heat the oven to Gas 6/200C/400F. Yes, preheat it before you’ve started making the dough; that’s how quick soda bread is. Mix all the ingredients together in a bowl, and leave to rest for five minutes, during which time it will absorb a little more liquid – although this is still a very wet dough. Form into a rough ball, and flump this onto a floured baking tray. Sprinkle with oats and a little flour, then cut a deep cross in the loaf (like, halfway through deep). Rest for another ten minutes, then bake for 30-35 minutes -like most bread, it’s done when it’s good and brown and sounds hollow when you tap it on the bottom. Leave to cool most of the way before you eat, or it’ll be a bit gummy. Slather with butter, whatever else you do with it. I’m preparing for Burns Night, the real foodie winter festival. It’s not that I don’t love Christmas (I’m deeply suspicious of anyone that doesn’t), it’s just there’re so many distractions – presents, decorations, family, carols – that it’s hard, sometimes, to just get stuck in. For Burns Night, on the other hand, there is just enough ceremony to provide an excuse for the meal, and no more – which is as it should be. Furthermore, as we’re not subjected to haggis sandwiches and three-courses-for-£25-office-Burns-Night-meals for a month and a half beforehand and are therefore not bored sick of the whole affair, no one has yet seen fit to mess around with the meal. Instead, we are bound by iron, delicious, tradition – and the fact that it involves offal and whisky makes it all the better. Of course, such a limited menu gives you little scope for showing off – so what do you do? You make your own haggis. I should warn you in advance that it is quite an undertaking, at least in terms of sourcing the ingredients; Fergus Henderson, whose recipe I adapted, seems to assume you won’t even try to make it, as he neglects to mention how hard it is to get a sheep’s pluck. I asked a couple of butchers, and scoured the internet, with no luck, but reasoning that the lungs probably don’t taste of much, I went with what I could get. Accordingly, this recipe assumes you will use sausage skins rather than one whole stomach; a less impressive spectacle, perhaps, but still very satisfying to make. Large branches of Tesco are good for lamb offal if your butcher can’t oblige; places like Lakeland normally stock sausage skins. The oatmeal might be hardest to track down – you don’t want rolled, porridge or jumbo oats, which are steamed. Try health food shops. Rinse the offal, then place in a large pan with the whole spices and stock veg. Cover with cold water and a big pinch of salt, bring to the boil, then simmer for two hours, skimming off the scum (there will be a lot) and fishing out the liver half way through. Meanwhile, sweat the chopped onion in lard or butter until very soft and sweet. When the lights are cooked and cooled (save 500ml of the stock), dice roughly then coarsely blitz in a food processor, using the pulse button – you don’t want a smooth paste. Tip the result into a large bowl, then add the cooked onions, the reserved stock, and the rest of the ingredients (apart from the sausage skins, obviously). Mix thoroughly with your hands, and salt to your liking. When happy, stuff or pipe into your skins or whatever; I used a sausage gun designed for the purpose, but a piping bag, bought or improvised, would do. If you can’t be bothered with any of that, just bake it in a flat tray like Paxo stuffing; it won’t be as fun, but will still be delicious. Leave your sausages in the fridge overnight to firm up. When you’re ready to eat, heat the oven to gas mark 5/190C/375F. Put the haggises in a deep, oven-proof frying pan, and just cover with water. Bring to a boil on the hob, let them bubble until the water’s half gone, then stick in the oven to brown up and finish cooking – another 15 minutes or so. Serve with neeps and tatties , a wee dram (mandatory) and perhaps some greens and mustard. Get someone to recite ‘Address to a Haggis’ in their silliest Scots, and plunge your knives in at the third stanza. Enjoy! Sometimes it’s nice just to follow a recipe. I own a LOT of cookbooks and eagerly await new ones, although I rarely follow them directly. There are a few exceptions, of course; technical procedures like baking or pickling, or dishes from cuisines that are entirely outside my understanding. In general, though, I (and I imagine a lot of people) use cookbooks chiefly for inspiration, the more so the more complicated the book is. I have never, for example, followed an Ottolenghi recipe through from start to finish; the number of ingredients alone is enough to put me off, even though I’d happily use that many myself when improvising. Fergus Henderson’s books are a joy to cook from, but the sheer effort involved can often be dispiriting – if it doesn’t need ordering in advance from a butcher, it probably needs brining for 5 days or (the most extreme, if tongue-in-cheek, example) cooking on driftwood in the Hebrides. Give me an Elizabeth David or a Claudia Roden, though, and I’d happily cook every dish. You look at the short ingredient list and think “How could that be nice?” – but it always, always, is. They are vague where they should be vague, and precise when they need to be, forgiving of substitutions and geographical issues with sourcing ingredients. Although they have both since been coffee-tabled up with hardbacks and photos, in their original editions they are perfect to work from, small enough not to take up half my work surface, cheap enough that I don’t worry about getting wine all over the pages… And with no varnished, styled images to compare the end product to, I’m generally happier with the result. Another fine food writer who seems to have resisted the coffee-table trend is Elisabeth Luard. Her European Peasant Cookery has the authoritative and pleasingly wordy air of a well-written reference book, a Brewer’s or similar; you can dip in and out whether cooking or not, and find solid, time-tested iterations of traditional recipes free from authorial meddling. If you want to know how to make, say, a pork pie, without Tom Kerridge or whoever faffing about with it, this is the place to go. So, I had some ox kidney, a steak in the freezer, and half a pack of suet in the cupboard; where else to look? A pudding for two. You’ll need a little pudding dish. The only deviation this involves from Luard’s recipe is in halving the quantities, and in the manner of arranging the meat; she slices the steak into little fillets and wrapping these around the kidneys, which seemed like a waste of time. Sift the flour and salt into a bowl, then stir in the suet. Gradually mix in the water until you have a nice smooth dough. Roll out two-thirds to line your buttered pudding basin, roll out a lid, then get on with the filling. Put a pan of water on to boil, big enough to house the pudding. Mix everything except the wine with a generous amount of seasoning, then pack into the pudding case (I know it seems weird to put in a raw stew mix, but it cooks beautifully in its pastry home). 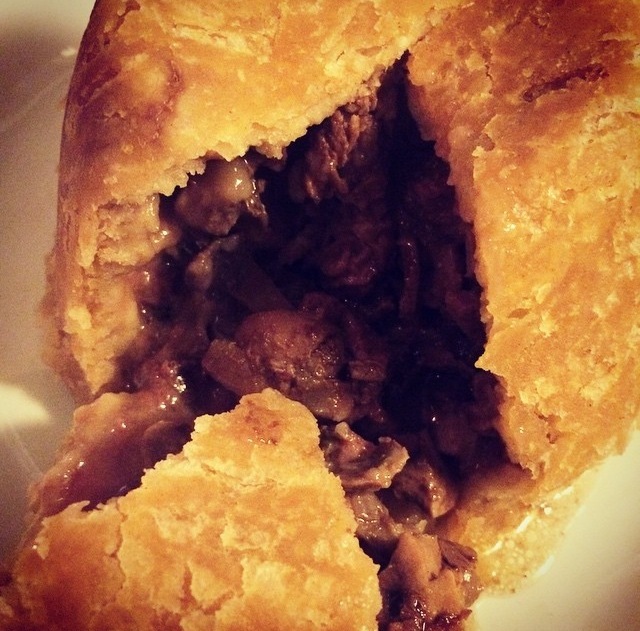 Pour the wine in, then dampen the edges of the pastry, cover with your lid, trim and crimp. Make a slit for steam, and cover with a disc of greaseproof and some foil, with enough give in it to let the pastry rise. Place a folded tea towel into the boiling water, to protect the pudding from direct heat, then place the pud carefully on top. The water should come two-thirds of the way up the basin, so adjust as necessary. Cover the pan and boil for three hours, making sure it doesn’t go dry. When done, take it out and let it settle for a few minutes before turning out. Serve with greens and mustard. I know a lot of my recipes are rather time-consuming, long, involved processes that can stretch over a few days, and I do find this style of cooking very satisfying – there is something quite exciting about watching the gradual formation of carbon dioxide in a sourdough, or the slow maceration of garlic in vinegar. There is a time and a place for such procedures, however, and a hungover New Year’s Day is not it. It baffles me why people decide to start diets on one of the most wretched days of the year. Kale granola is all very well for your long-term health prospects, but is no use at all in wrestling a hangover to the ground. You need filth, fat and protein and carbs, and most importantly, you need them quickly. Given time to sink in, the hangover will easily get the better of you – get the jump on it, though, and you’ll soon see it off. This is a brunch menu that can be prepared quickly, easily, and with your eyes half-closed. Pour the tomato juice into glasses, and the coffee into cups, topping up the latter with some milk (black coffee=heartburn city). The water should be drunk straight from the bottle. Consume in alternating gulps until all are gone, nibbling at the toast in a desultory fashion. This is your detox, so don’t enjoy it too much. Fry the eggs in butter, sprinkling with seasoning and chilli. Toast the bread. Spread with butter, and then two slices with pate, sprinkling over the garlic. Construct two sandwiches, and eat greedily. Fry the cake very gently on each side, sprinkling over a little salt. 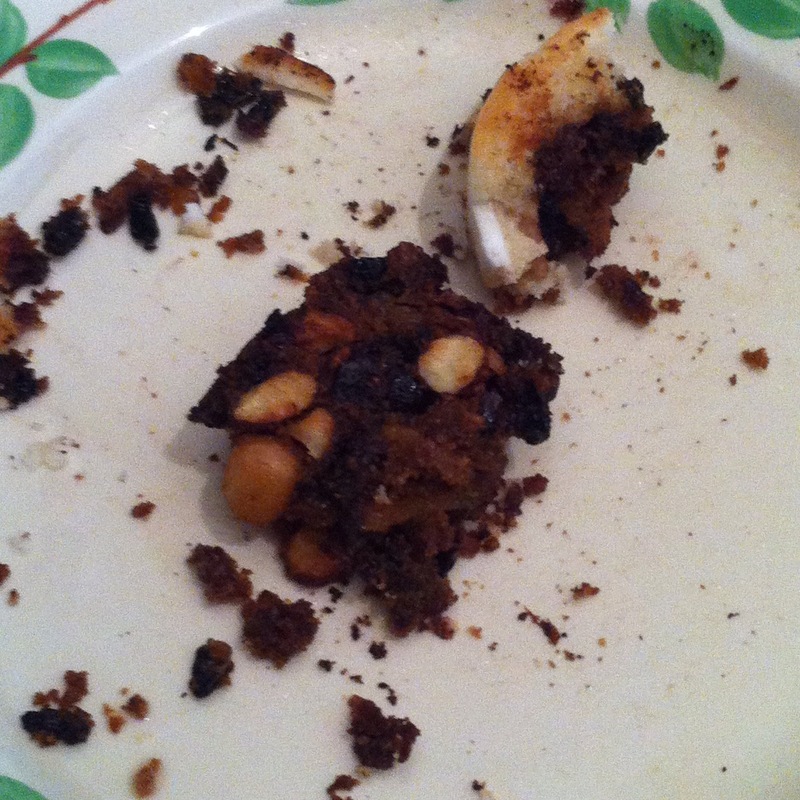 The marzipan and nuts should be caramelised and golden brown. Goodbye hangover; hello a new and better you.